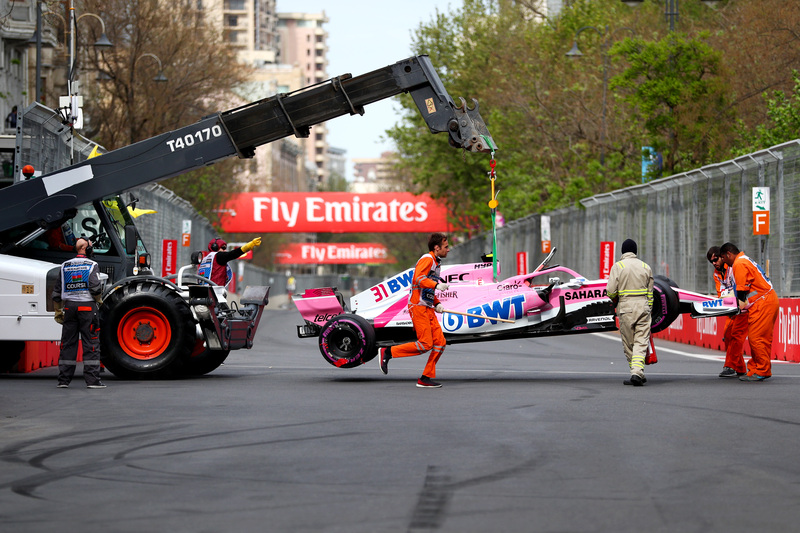 There was something incredibly apt about the promotional banners welcoming Formula 1 to Azerbaijan's capital reading "Street F1ghters," as the battle was on from the moment the red lights switched off at the Baku City Circuit. After going the distance—51 laps, in this case—it was Mercedes' Lewis Hamilton who was left standing on the top step. For most of the race, it was the other drivers at the front trading punches, with Hamilton seemingly keeping his feet planted and sticking his guard up. The Briton didn't look to have the pace to do anything but follow Sebastian Vettel early on from second, but the race came toward him as his rivals either took each other out, made mistakes, or ran into bad luck. 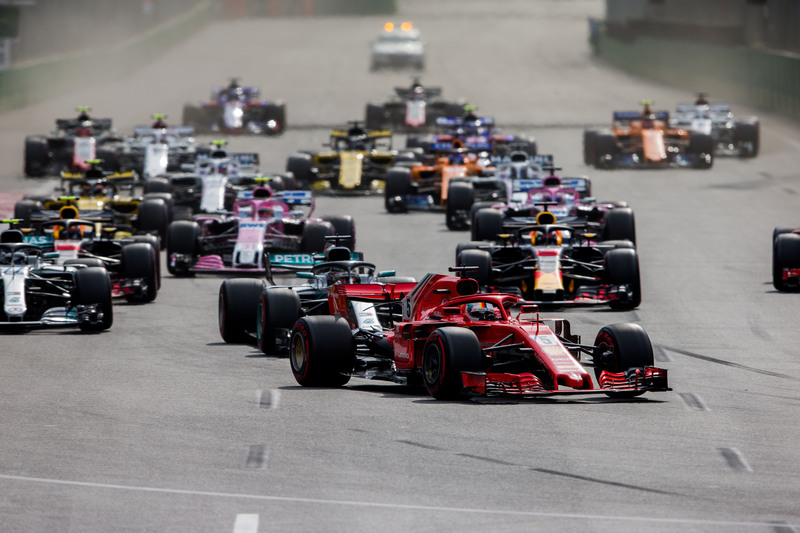 With Vettel leading up front, followed by Hamilton and Valtteri Bottas, much of the early action was focused on Red Bull Racing's Daniel Ricciardo and Max Verstappen. After an early race safety car due to several first-lap incidents, the Red Bull Racing duo found itself under attack by Renault F1's Carlos Sainz and Nico Hülkenberg, with the Red Bulls struggling a bit early on. After the Renaults dropped away, Verstappen, who had overtaken Ricciardo on the first restart, found himself back under threat from his teammate. The two certainly weren't wearing kids gloves once they engaged each other as there was a healthy dose of wheel-banging on the exit of turn one when Ricciardo tried to go around the outside on lap 27, with Verstappen just missing his braking point on the inside. Verstappen just held on to fourth, but Ricciardo subsequently cleared his teammate on the start/finish straight several laps later, cutting in front going into the first bend. Their pit stops brought Ricciardo's hard work to naught, however, as a slower out-lap by the Australian helped Verstappen come out ahead in fourth after his own pit one lap later. Clearly not ready to throw the towel, Ricciardo went for it again on the start/finish straight. The 2018 Chinese Grand Prix winner threw a dummy, with Verstappen countering, and the two Red Bulls colliding. Ricciardo and Verstappen barely looked at each other as they climbed out of their smashed up cars parked in the turn one run-off. The following clean-up then resulted in a lengthy safety car. At that point, Bottas was leading the race. The Finn had gone long on the set of Pirelli Supersoft tires he'd started on, taking the lead from Vettel by staying out when the German pitted. 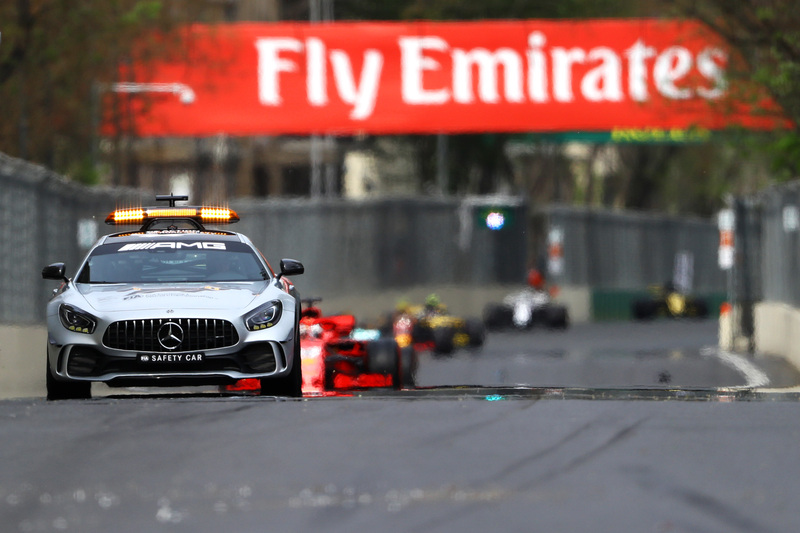 The safety car played into Bottas' hands wonderfully as it effectively gave him a "free" pit stop, and he was able to make it back onto the track ahead of both Vettel and Hamilton under caution. At the somewhat delayed restart courtesy of Haas F1's Romain Grosjean crashing his car when weaving to warm up his tires, Bottas immediately was under attack from Vettel. The Ferrari driver pounced in the first corner, but misjudged his braking and ran wide, as Bottas got clean through. With three laps to go, it seemed Bottas' race to lose—and it was. Running over a piece of debris on the front straight, the Mercedes driver suffered a puncture and had to retire. It promoted Hamilton into the lead, ahead of Kimi Räikkönen and Force India's Sergio Pérez, the two of them having had chaotic races as well. Hamilton said it best when taking the top step: "I was really fortunate, it feels a bit odd to be up here." Full Grand Prix results can be found below. Business as usual for Vettel in 2018, who achieves his third consecutive pole position.